Dog Days Flea Market in Ardmore, Tenn., is open Saturday and Sunday year round and offers a variety of goods for sale, but this isn't the typical flea market. In addition to the usual yard-sale antiques and other gently used goods, shoppers can find livestock, groceries, and home supplies—everything including the kitchen sink, according to the organizers. As the flea market typically replenishes its good every weekend, you'll want to arrive early before all the good bargains are gone; bargain hunters will usually start coming early Saturday morning and stay until sunset. Dog Days Flea Market is open year-round plus two special long weekends: Memorial Day and Labor Day. These two weekends are the busiest for Dog Days Flea Market with well over a thousand vendors plus many thousands of treasure hunters heading for this Ardmore flea market. Dog Days Flea Market is located at 30444 Gowan Road in Ardmore, Tenn., and open from 6 a.m. to dusk on Saturdays and 6 a.m. to 12 p.m. on Sundays. Dog Days Flea Market sits on over 100 acres of land in an open field. The flea market actually started in the 1940's as a place where hunters would meet on Mondays to let their hunting dogs run in the woods and trade dogs, hence the name. Over the years, the market expanded to include other things besides dogs for sale. Now you can find miniature horses, plants, trees, cattle, exotic birds, antiques, and a wide array of collectibles, as well as the typical flea market, yard-sale goods. The present owners are Alex and Tina James. They bought the Dog Days Flea Market in 2000 and added electricity, showers, and other accommodations for the vendors. It's become more of a traditional flea market (as opposed to a livestock auction) since they took over. Dog Days Flea Market is divided into two areas. Parking is $1 and $2, depending on how far back in the field you have to park. There is plenty of food to buy if you get hungry: ice cream, shaved ice, hot dogs, hamburgers, grilled chicken, fresh-squeezed lemonade, and a full breakfast are all on the menu. On Sundays, the Dog Days Flea Market also hosts an animal and chicken yard on the grounds with ducks, rabbits, goats, and pigs. Alternatively, there are also several livestock stands on-premise and places where you can buy pets like dogs and cats, too. 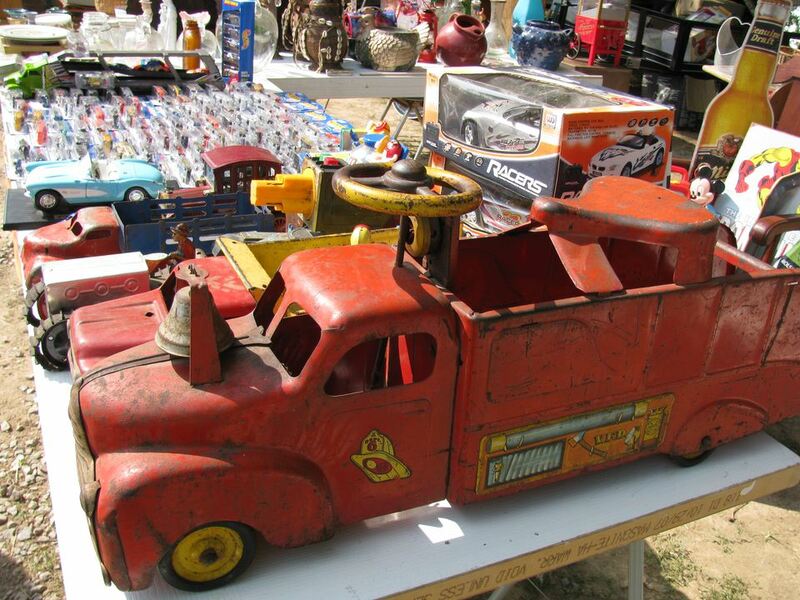 In addition to the numerous collectibles' stands throughout the flea market, there is also an entire building devoted to antiques at unbeatable prices. Those with a discerning eye can find some great bargains in the antique's building must easier than in the rest of the market. Due to its location near the Alabama border, this Tennessee market also attracts several Alabamans and Georgians. With everything from four-wheelers to the kitchen sink, you're sure to find something to take home during your trip to the Dog Days Flea Market. Food, Drinks, Live Music, and More!